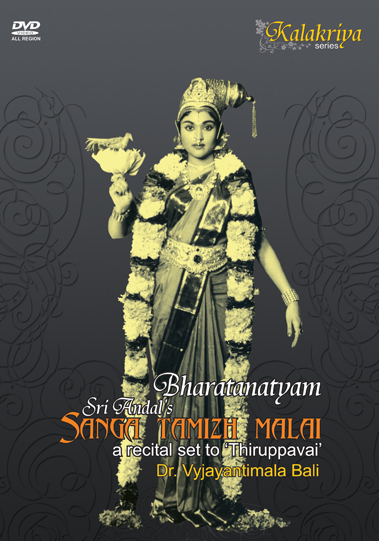 This product,re-created from live video recordings of yore, unveils the creative genius of Dr.Vyjantimala Bali,the celebrated Bharatanatyam artiste of our times.In a solo Bharatanatyam recital-the first of its kind- she takes us through the sublime delights of Sri Aandaal'sThiruppavai which permeates the cool pre-dawn air in the Tamil month of Markazhi. Much to the dellight of both learners and lovers of Bharatanatyam,Dr.Bali employs all the copybook techniques in Bharatanatyam repertoire to bring alive the 30 hymns of this divine work in an arrestiong and authentic manner.Each lap of the recital is preceded by the artiste's lucid explanation of the scenario,characters, rich imaginary and the profound meaning of Thiruppavi verses. Another highlights of this product is the introductory speech by Dr M.A.Venkatakrishnan, a renowed scholar & professor of Vaishanavism,University of Madras. A perfect learning tool and a document on a flawless style.